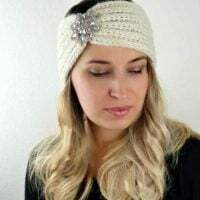 Browse hundreds of free patterns right here at Oombawka Design. Join the 10,000+ other Crocheters who love receiving free patterns and subscriber only specials. 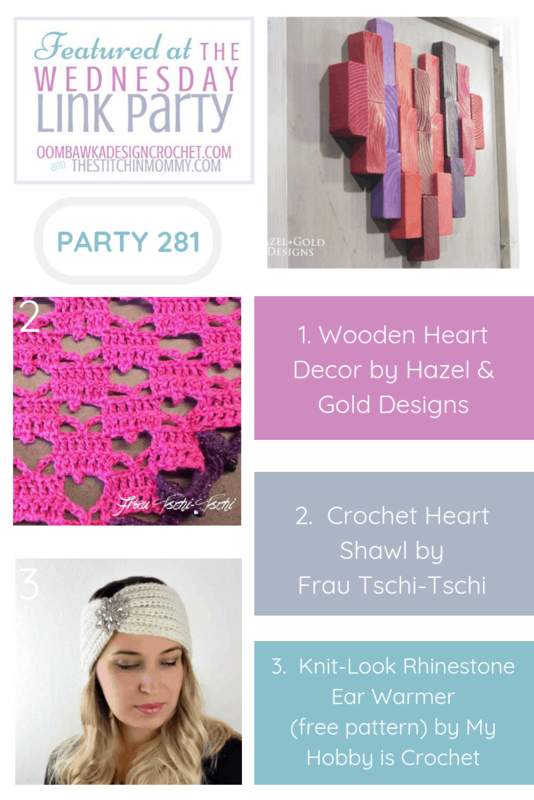 This week our three featured projects include a great DIY Wooden Heart Decor project, a lovely crochet Heart Shawl (links to the free pattern) and the trendy Knit-Look Ear Warmer (free pattern). Get the free pattern links below the Collage image and make these great projects too! While you’re here check out the other submitted projects in our collection! Every week we have new freebies, recipes and DIY projects being added to our party! Find out what the latest trends are by joining us each week. Visit our weekly Link Party to find new projects to try, crochet patterns and crafts! Add your own projects to the party for a chance to be featured across our social media channels! Please provide a link back OR a sidebar button to the party on your blog. They are available HERE. PIN the Featured Favorites from this week! or Share them on Facebook! Share as many links as you wish to family friendly, fiber arts, DIY, crafts and recipes. Visit and share your favorite submissions by the end of the day on Saturday to help choose the featured favorites! Many of the projects included in our Link & Share Wednesday have been created using other Designer’s Patterns. Find the links to the original pattern source(s) included in the Project Posts. If there is no mention of a pattern, please feel free to ask them by leaving a comment on their post! You are invited to the Inlinkz link party! Please take a few moments to share Party 281’s Features! Thank you! 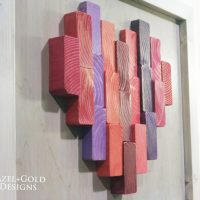 Follow this great step-by-step photo tutorial to make your own DIY Wooden Heart Decor project. 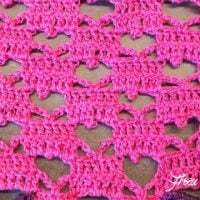 This beautiful Crochet Heart Shawl was crocheted with free instructions. There's a YouTube Video too. Create this beautiful cinched knit-look ear warmer with this free pattern. You can add a pretty applique to the front or leave it unadorned for a classic headband. For even more free patterns visit me on Pinterest, Facebook & Instagram. Or, get your weekly ‘free crochet pattern fix’ straight by email! Where can I find written instructions for this shawl? Copyright © 2019 Oombawka Design Crochet is part of Oombawka Design, Ltd. Corporation. All Rights Reserved. Oombawka Design Crochet is a participant in the Amazon Services LLC Associates Program, an affiliate advertising program designed to provide a means for us to earn fees by linking to amazon.com and affiliate sites. Site by Moonsteam Design.